So I've been kicking around several ideas to be my first kig, but I haven't really settled on any because I see they've been done before. My first idea was Anna from Frozen, and I may yet still go with that idea, but I wanted my first to be something that hasn't been done yet. I also looked into Mari Makinami from Evangelion. I actually have a tattoo featuring her prominently and I think she's pretty awesome. The only issue with her is she's very intense in most pictures, art etc. I think she would have to be made... more kawaii... if that makes sense. My latest idea, which I haven't seen anybody do yet, could possibly get my gf involved too. When she and I met, we lived 3000 miles apart, so we spent time together playing Final Fantasy 14. I thought, how cool would it be to actually make full on kigurumi cosplays from our characters. FF14 characters aren't quite as anime looking as typical kigurumi so I don't know how that would translate to a kigurumi mask. I don't want to end up making something that looks creepy because it's not anime enough. Below is a reference image of my gf's character. 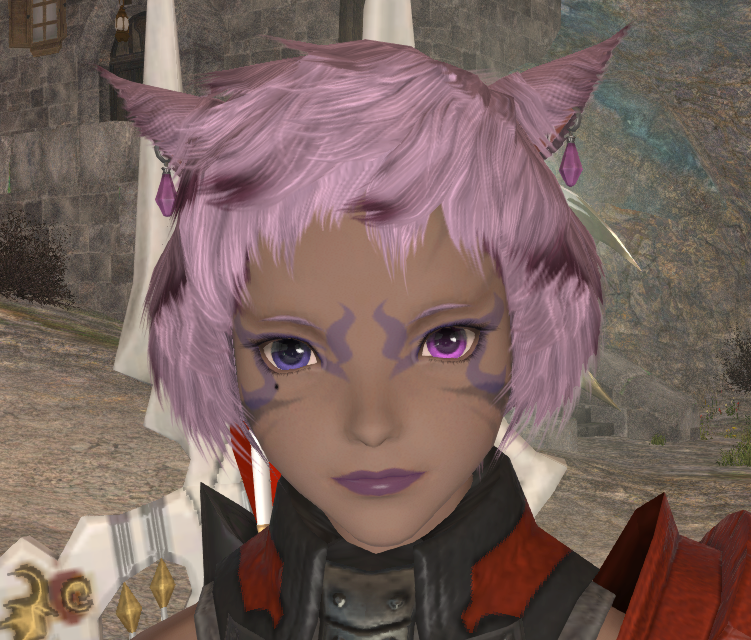 I would like the experts to chime in and tell me if making masks based off FF14 catgirls is feasible and not a terrible idea. This would not be the first time that a Final Fantasy character was done as a Kigurumi. What you are talking about, is basically going one step beyond a mere Cosplay of a character, to something which looks more like the 2D character just stepped into the 3D world. Post was edited 2 times, last by “Miss Kiki” ( Apr 26th 2018, 12:16am ). Thank you Miss Kiki. As someone new to this, I keep forgetting that not all kigurumi is the same style. I have definitely seen plenty of the BJD masks that I thought looked great, but for some reason, whenever I imagine a kig I will wear or build, it's always in anime styling. This is my own limitation which I will overcome. The more I think about making our characters, the more I like it. I can't say that I will make them first but I will definitely make them. Certainly cosplaying them would be easy for us. As you mentioned, it's our own OC so no one can tell us we're doing it wrong. Autumn, I considered Mari for quite a while. Great minds think alike At the end of the day, you have to do you. At the end of the day, you have to do you. I dunno, it would just be weird making a kig mask of my own head. I think I should stick to anime or video game characters. I still think I will eventually end up playing Mari at some point but I need to see a demonstration of how others have turned serious/intense characters into fun kigurumis so I have a better idea of how to accomplish it. I would want people to see the characters I play in a positive light. From direct experience @AutumnDawn coming from a builder's POV the anime genre is much easier to build and for a starter I'd recommend that. oooooo, a final fantasy Kig. You should definitely go for it! After much thinking, I went in the anime direction, as per @cici 's recommendation. I remembered that I liked one of the characters in Sword Art Online, so I found some reference images and loaded them into blender and proceeded to create a new mask of Asuna. I had never used blender before, so there was a learning curve. Basically, my solidworks experience is not very useful with regards to blender and organic shape modelling. Now that I know I can make a model, I will be looking to get a 3d printer. I'll make the Final Fantasy 14 mask(s) after getting some experience with something easier. Post was edited 1 time, last by “AutumnDawn” ( Apr 27th 2018, 8:44pm ). I'm also looking into trying to 3d print masks, so if you have any success do share! That's really fast progress with blender. I've been working at it on and off for the past month and I'm not at that stage yet. Looking forward to seeing this project develop. I'm aware of a few Final Fantasy catgirl masks. Mostly mithras from FFXI though, but they look pretty similar except they have brown noses. Getting people interested in kig?